LOCATED AT THE STORE STUDIOS, 180 STRAND, THE DESIGNER SHOWROOMS IS HOME TO OVER 150 BRITISH AND INTERNATIONAL DESIGNERS. PRESENTED WITHIN IS A RICH AND DIVERSE SELECTION OF PRODUCTS IN A HIGHLY CURATED SHOWROOM. SHOWCASING AT LONDON FASHION WEEK RAISES THE PROFILE OF BRANDS AS PART OF LONDON FASHION WEEK’S EDIT OF WHAT TO SEE. The international element of the showrooms illustrates that the doors to London are truly open, with designers showcasing from Dubai, Finland and South Korea. The pull of London on a global scale is undeniable. The UK continues to be an attractive and fertile home for an array of designer businesses of any size. Of the four fashion capitals, London is the only city that hosts the Designer Showrooms in the same venue as the official British Fashion Council (BFC) Show and Presentation Space. The LFW Designer Showrooms have launched many global brands, including a number of on-schedule designers. Showcasing in the highly curated Designer Showrooms allows brands to develop relationships with globally influential stores and helps to increase their exposure to top international journalists, publications and stylists. In addition to this, designers will also gain access to seasonal press and buyer accreditation lists and access to the BFC’s Designer Support programme, which includes one-to-one business advice and seminars. Wooh! A touchy but true read this is. As other reviewers have said about the book, I don’t agree with all aspects but so many of her points on modesty and dressing according to how you would like to be treated was so on point. She also touched on the history of fashion in America. Here is an overview of the book. In this ground-breaking book, Colleen Hammond challenges today’s fashions and provides you the information you need to protect yourself and your loved ones from the onslaught of tasteless, immodest clothing. Colleen Hammond shares real-life examples of how women can accentuate the grace and beauty of their femininity, and she shows that modest definitely does not mean frumpy !! DRESSING WITH DIGNITY covers it all . . . The history and forces behind the changes in fashion. How to talk to teenagers about the privilege of femininity so they will want to dress with dignity. How to awaken chivalry in men and be treated with respect. How to regain and teach the lost charm of interior and exterior femininity! How to dress in an attractive, dignified, classy manner! Specific documents about manners of dress from the Magisterium, the Popes and the Saints. Comprehensive guidelines for choosing tasteful attire. Resources on where to find beautiful, modest clothing. And much, much more! Here is a pic of a beautifully modestly dressed lady that I found which led me to the the author Colleen’s book and we paired it with a pair of Thaqafah tri color mules. And check out Thaqafah shoes here. Today Moma shoes are on the feet of men living in the four corners of the globe; this makes these shoes not just a simple accessory, but a way to express themselves. Moma footwear owes its specialness and its beauty to craftsmanship. In fact, each shoe sees the light still in the same small workshop in the heart of the Marche. A real resistance in a time of total standardization of goods and flattening of styles. Worn, dirty, aged, Moma shoes are like wrinkles: every chromatic shifts, every irregularity, every detail that may seem a flaw, tells a story, an experience, a person. So, as time goes by, the beauty of MOMA shoes becomes more authentic and marked by life, just like a man’s face, in full compliance with the corporate philosophy. We are presenting a blast from the past for us, meaning finding this shoe brand again was so nostalgic for me that I could taste it. Sergio Tomani was one of the shoe brands that I used to drool over in my teenage years while visiting the only store in my city who carried them which was dudes boutique on South street in Philadelphia,Pa. I am so happy to see that they are still going strong and have kept the same aesthetic that makes them unique and grungy in my opinion. If you would like to see more of their collection visit the site here. Dondoks: When Two Paris Showgirls Make Shoes! I love finding out about new shoe brands. Especially ones that are female-driven & incredibly original, like Dondoks, designed by two fabulous Parisian show girls with flare! When shoes are this extraordinary, there’s usually an exciting story behind them. And Dondoks — a Paris-based, Brazillian-made shoe brand — is no exception, as it was born from a deep seeded love and friendship! Carmen and Charlotte met while working together in wondrous places: as showgirls at the Moulin Rouge, the Lido in Paris and modelling for Jean Paul Gaultier. And of course, they became instant friends! Both ladies are professionally trained dancers from Mexico and France, respectively. Charlotte, while working, was also studying fashion business at ESMOD in Paris, which helped the duo with creating their brand. And of all places, because she and I are actually fellow alumni! The ladies’ shared passion for shoes, the Parisian lifestyle & a flair for the exotic is how Dondoks was born. And if anyone is curious as per the name, it comes from a Brazilian expression that means “daddy’s girl”. The brand’s motto is high quality and high fun & the resulting product is just that! 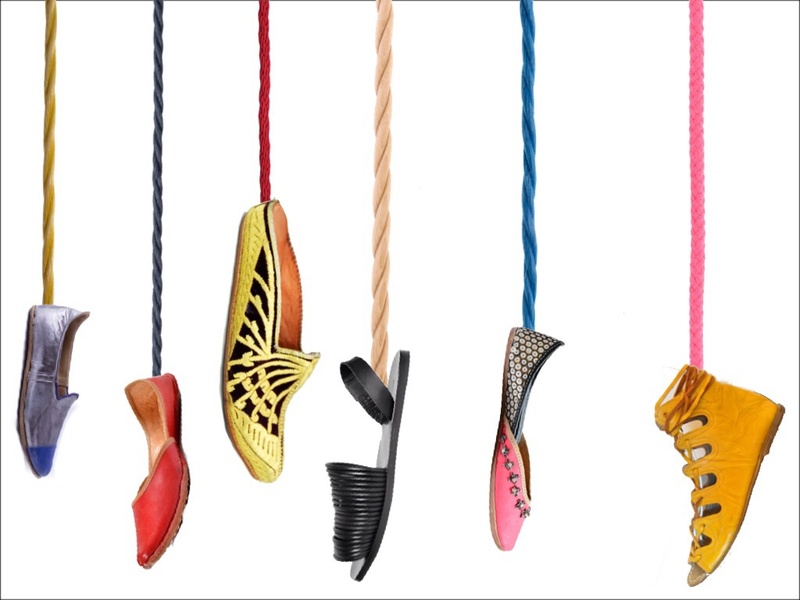 Colorful & stunningly creative, Dondoks shoes are not your average ho-hum footwear! The polar opposite of ubiquitous mass production, the Dondoks brand wants to raise awareness of high quality materials & local production and ethical practices. Handmade from stunning leathers & materials in Brazil by artisans, Dondoks’ current Spring/Summer 2018 “Candy Rainbow” collection — composed of 4 shoe designs — embodies fun, glamour & sophistication. There’s a definite Moulin Rouge feel throughout the collection, which I’m totally here for! I love that their designs are whimsical & girly, yet not unwearable. They have girly pink frou-frou styles, yet you can also achieve the same vibe in more neutral colorways such as black & peach. And as all shoes should, they will add panache to any of your outfits this season! As per the fit of the shoes, they do work best for a slim to medium sized foot. The black & white Mely sandal fits true to size, while the Frida flat (pictured in this post in blue and emerald), does fit rather small. I would size up. Each pair of shoes is shipped in a solid color-blocked shoe box & includes a pink branded satin shoe bag.